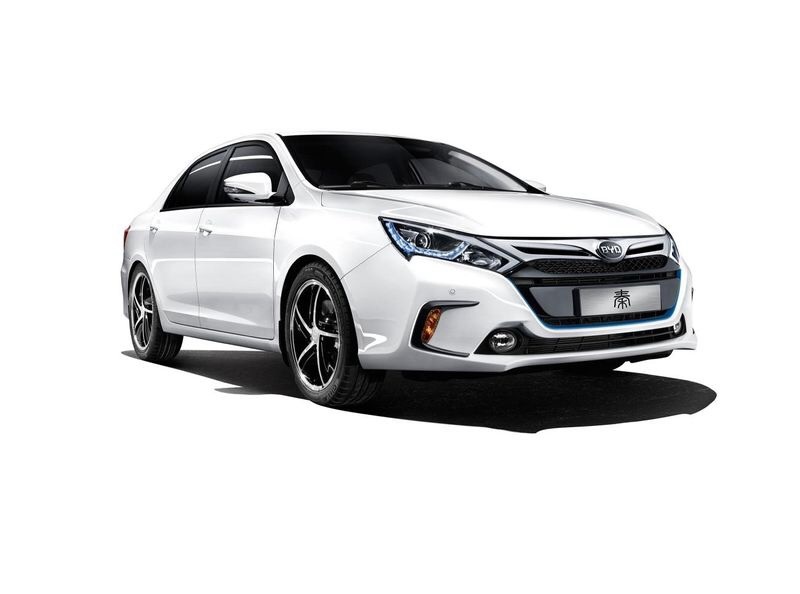 BYD Auto’s Qin model PHEV has finally hit the Chinese market — the performance-based hybrid possesses a number of notable specs, and should generate some good sales for the noted EV manufacturer. Among the model’s notable qualities, are: a rapid acceleration of from 0 to 100 km/h (62 mph) in 5.9 seconds; a top speed of 185 km/h (115 mph); and an overall fuel consumption of up to 1.6 L/100 km (147 mpgUS). The model can also travel up to 70 km (44 miles)using nothing but the electric battery — longer journeys can make use of the 1.5TID gasoline engine. The new car utilizes the technology pioneered and proven in the original BYD F3DM model, of which many tens of thousands have been sold, the company says. The Qin can be recharged at any normal household socket. When power is low or there is an on-demand need for ultimate acceleration the hybrid mode (charge sustaining) is activated; this can be programmed either automatically or manually. 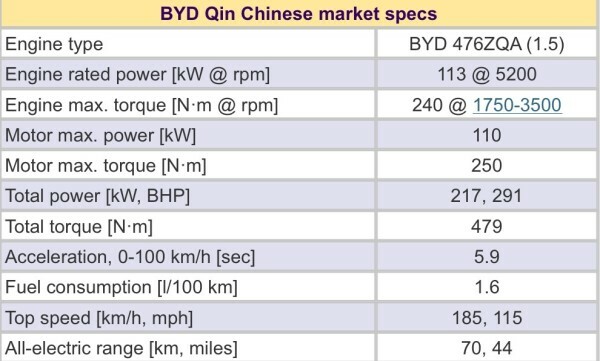 The Qin also generates electric recharging power during deceleration—either by means of engine braking or via the foot brake—typically contributing 2.5 to 3 kWh every 100 km (62 miles). The Qin offers four driving functions: EV+ECO, EV+SPORT, HEV+ECO and HEV+SPORT modes. These can be selected by the driver, commanding the appropriate blend of economy and performance for any driving condition. All models in the Qin family feature a 12.1-inch TFT instrument panel, smart key system and BYD’s remote driving facility, which allows the car to be maneuvered remotely at very low speed from the outside of the vehicle where permissible. The model is currently expected to hit the European market sometime in 2015, before being rolled-out elsewhere — there is some talk about the model being partially modified for the other markets though.